Selling Short Stocks in the Stock Market Explained for You! Now that you know the Selling Short Don't's in the stock market, lets get into what you really want, the Selling Short Do's. Click the above links for a detailed explanation on how to trade each pattern. Look to see if the Industry Group it is in has broken below it's 30 Week MA. You can use a stock screener to determine which Industry Group it is in. Insure that the Stock individual chart shows it below it's 30 Week MA, with the MA NOT trending up. For further in-depth information on selling short, Stan Weinstein's book Secrets for Profiting in Bull and Bear Markets contains everything you need to know to help you learn how to short stocks explained in a simple and concise manner to improve your stock trading success. Also, William J. O'Neils book How To Make Money Selling Stocks Short offers simple and timeless advice in how and when to sell stocks short, c/w with dozens of detailed stock charts showing actual short sells. How to take advantage of making money "both ways"
1. Confirm the strength of the trend. 2. Look for a price pullback c/w at least 3 consecutive up days with higher highs. Volume should be lower on the pullbacks. 3. The 5 Day RSI Indicator should be above 50. 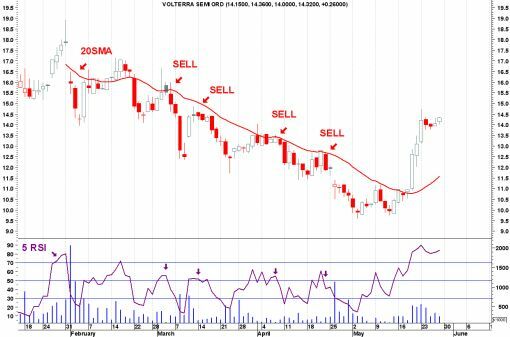 When the RSI forms a top and begins to turn down, you should look for a share price retracement to bounce off the 20 day simple moving average (SMA). 4. Look for key Candlestick reversal patterns at the bottom of the pullback such as the Harami, Engulfing pattern, Dark Cloud Cover or the Evening Star Doji. 6. Insure your position sizing and money management rules are in place. 7. Sell short and make the stock trade! This is just one of many Swing Trading techniques. Author and expert Swing Trader Kevin Brown has created The Definitive Guide to Swing Trading Stocks. This program has earned a reputation as the #1 Swing Trading Course available online and will help make you a more profitable trader for selling short. Have you used any of our recommended Selling Short Systems? Did you experience a positive impact from it? Share your personal experience and write your review including how it helped you the most for Short Selling Stocks in the stock market. Return from "Selling-Short Do's" to the Home Page: "Stock Market For Beginners"